John Houseman (pictured) is a man with a mission. An Ironman with a mission. 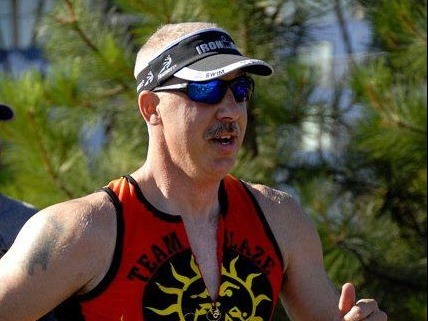 On June 23, 2013 John is putting his heart and soul on the line, racing in an Ironman competition for the benefit of Caroline’s Cause. John lives in Idaho and he’s Caroline’s new biggest fan. While the folks on the East Coast are having their annual golf tournament for Caroline’s Cause, John is sponsoring his own event. Teaming up with Caroline Elhajj of Caroline’s Cause. Together we are tackling Ironman Coeur D’ Alene. We hope to raise enough funds to purchase or help purchase a large portable generator. This generator will give both Caroline and her family the piece of mind they need in the event they lose shore power. Caroline receives various medical treatments about every 3 hours to help clear her airway and keep her healthy. She also receives nourishment throughout the night with a food pump. Please join us and share this cause with your friends and family. Won’t you consider making a donation? We’re back for another year! Once again we’re going to be in Middletown at Sunset Golf Course. The success of last year’s tournament enabled use to purchase a golden doodle for Caroline. The dog, Jasmine, is a companion for Caroline. Jasmine also is trained to get the phone, emergency medicine, and toys (to place in Caroline’s lap). This year we’d raising money to renovate the shower and purchase a home lift system to move Caroline from room-to-room so that she can access her bedroom, bathroom, and the living room with ease. Registration begins at 7:00 a.m. and includes breakfast. Shotgun start begins at 8:00 a.m. Grilled stead dinner at noon, along with awards and raffles. Check out the pictures from last year! The lunch and awards were a blast! Download the registration form: 2012 Golf Tournament Reistration form (ignore the incorrect date in the form. 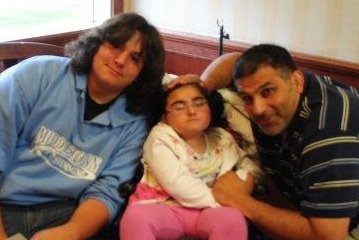 The 3rd annual Caroline’s Cause Golf Tournament is June 23, 2012). Rett Syndrome is a neurological disorder that has been reversed in trial studies using laboratory mice. Researchers are making strides to make Rett Syndrome the first neurological disorder to be cured. We invite you to be part of our cause! A New York City subway train holds 1,200 people. This blog was viewed about 4,600 times in 2011. If it were a NYC subway train, it would take about 4 trips to carry that many people. Caroline’s Cause 2nd Annual Golf Tournament, a set on Flickr. Last week I flew into Pennsylvania for the golf tournament that Caroline’s Dad hosts each year. It was a hoot. I’ll update the blog with more information about the day, but for now I wanted to share some of the pictures I took. Enjoy! This year, we’re changing the location of the golf tournament. Registration will begin at 7:00 AM and include a continental breakfast. Shotgun will begin at 8:00 AM. Lunch will be provided, along with the awards and raffle. We will also be selling raffle tickets prior to the golf outing — and the day of the golf outing. The raffle ticket is $5.00/ticket or $20/5 tickets. Other opportunities for raffle prizes will be available the day of the tournament and include many gift baskets and other prizes. If you don’t know a 9-iron from a putter, that’s okay. Come out anyway and join the fun, whether you’re golfing or helping in some other capacity. All are welcome. 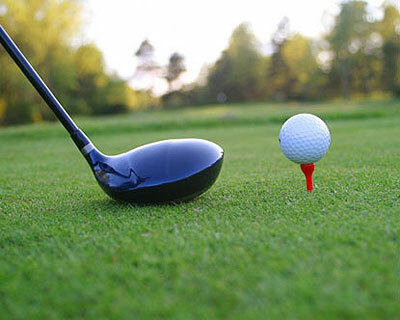 We also have two letters (below) soliciting sponsors for golf holes. Sponsorship is very important to reaching our fund raising goals. Give these letters to your boss or people who own business you think might benefit from our promotional efforts, including a large sign with their businesses’ name on it over one of the golf holes, proudly showing their support for our cause, t-shirts (my daughter Kennedy was wearing her t-shirt from last year this morning, so you know that’s a good promotional deal), and the good will of all the people at the tournament. Everyone asks who the sponsors are and what their relationship is to the rest of the family. Sponsors earn a lot of good will from the community by donating money. This year the proceeds will go to erecting a rail system in the house to move Caroline around and a special pet dog that can sense the onset of a seizure and warn the rest of the family. One letter is an Caroline’s Cause Letterhead, Caroline’s father. The other is a Caroline- Sponsor letter revised 2011, but this one is on Caroline’s Cause stationary and has a little form to fill out. Which one should you use? Use the one you think will work best for whomever it is you’re trying to solicit a donation. We just got slammed in Washington state last night with another big snow storm. What an adventurous winter! 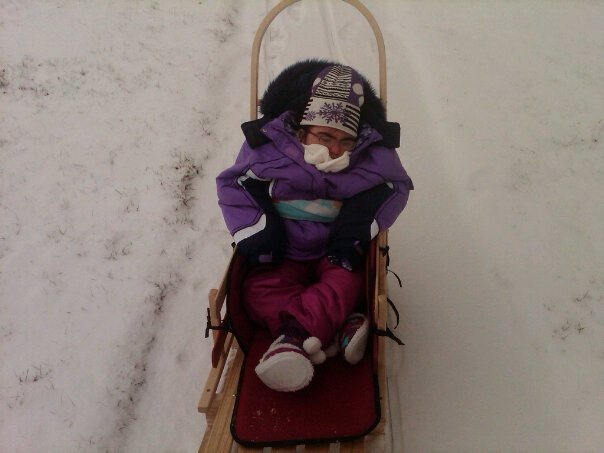 I’m not sure if most of you have seen these pictures of Caroline out for a little family sledding fun, but I saw them on Facebook and wanted to add them to our picture feed on Flickr and pop them up here, too. I believe read on Tony’s wall that Caroline really enjoyed sledding. 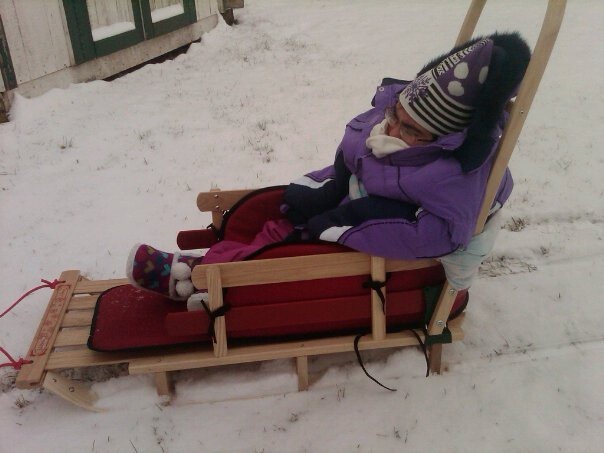 It looks to me as if she has her own specially built sled, with a handle for an adult to push her and sideboards to hold her inside. 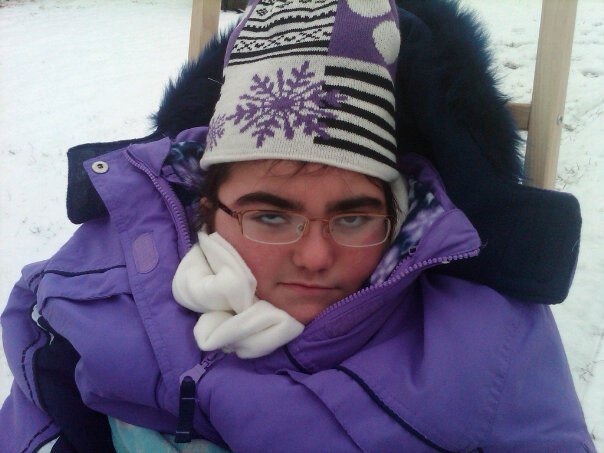 Looks like someone had to sacrifice a scarf to tie her into the sled. 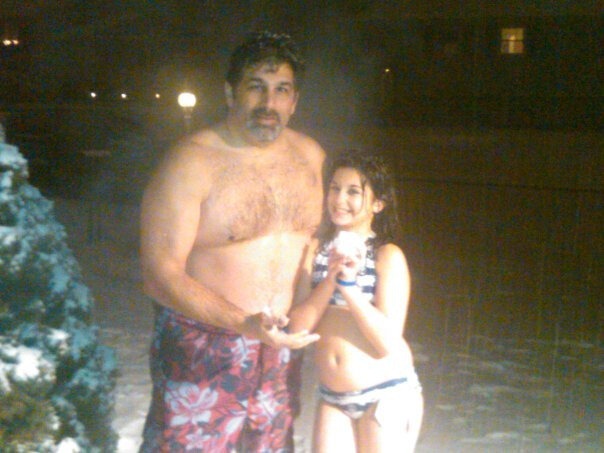 I also found pictures of what appears to be polar swim in Caroline’s front yard. I know the hot tub Caroline uses for water therapy is in the car port. It looks like someone may have been relaxing in the tub when the snow started falling. Something about watching new snow fall always makes me long to act a little wild and crazy! Perhaps I’m not alone. If you’re like me, you have never heard of The View, a daytime talk show with a bunch of women talking about politics and current events. Last week The View turned their attention to Rett syndrome, featuring a segment with a young family whose daughter had recently received a Rett syndrome diagnosis. Halfway through they ask what people can do day-to-day to help out, if they learn your family has Rett. Donate to research. I am always struck by how confident the families of Rett girls are that a cure is just around the corner. Tony is absolutely like this. If you read many of the posts here, you know that yourself. In 2010, there were 74 new posts, not bad for the first year! There were 220 pictures uploaded, taking up a total of 264mb. That’s about 4 pictures per week. The busiest day of the year was December 6th with 142 views. The most popular post that day was The True Meaning of Christmas. The top referring sites in 2010 were facebook.com, telhajj.com, and en.wordpress.com. Some visitors came searching, mostly for caroline’s cause, cash prize, cofflator, purple balloon, and rett syndrome. 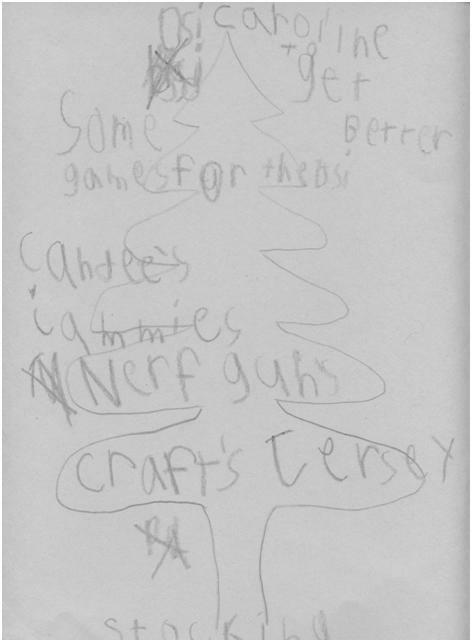 This poem below was written by Jayson, Caroline’s big brother. If you have never met Jayson, he is someone you would really like to meet. At age 15, he has defined himself as a young man with a heart of gold. At an early age of about 4 or 5, I remember Jayson playing with his whinny the pooh figures (his favorite was Tigger — sorry Jay) and his cousin was coming to visit. 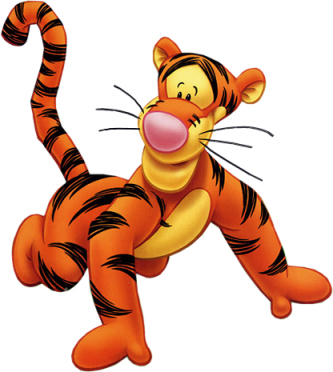 Now his cousin also liked Tigger, so Jayson was beside himself because the only Tigger he could find was the one he was playing with at that moment. It took Jay all but a minute to decide to give up his toy to his cousin. At that point, I knew he was someone special. He has continued to grow over the years both physically and emotionally to who he is today. He aspires to be a writer or an engineer (he originally wanted to be a McDonald’s employee, so I am relieved). One job Jayson has taken on and proves day after day is Big Brother to both his sisters! The world could use a little more Jayson in it. I understand, I recognize, I speak with my eyes. I fly among the angels who pray for me. So I will never give up, until the cure comes. I believe I will walk, I will talk, and I will dance with my family. And my name is Caroline. ﻿Today’s Headline News: Caroline ate a few spoonfuls of applesauce. Big news, right? Well, it is if you haven’t had anything to eat with your mouth in over six years! After Caroline’s diagnosis of Rett syndrome, one the of first procedures we had done was placing the g-tube in my little girl. The doctors convinced me this procedure was necessary to sustain her health and to keep her nutrition levels high. Caroline’s lack of muscle control made it very difficult for her to swallow properly so she aspirated, which put her in the hospital with pneumonia a few times. One thing I can say about Caroline’s support team is that we ALWAYS think outside the box. Dr Warren, Caroline’s favorite care giver, once said to me,” We have to be pro-active and aggressive with our care for Caroline.” He coached me with proper suction techniques, respiratory treatments, and provided support and guidance over the years, all the way up to his retirement. His foresight still remains in effect today. A few years ago, Caroline was doing extremely well health wise. She hadn’t had any of the recurring bouts of pneumonia, so we decided to step it up a notch as the good old doctor had advised. We got involved with a speech therapist and nutritionist at the feeding clinic at Hershey Medical Center. If Caroline could swallow more effectively, we thought, then she would be able to clear her natural secretions and not aspirate. We started with some oral stimulation exercises, which created saliva so that she could learn to swallow. This treatment continued for over a year, three times a day, every time Caroline was tube fed. She responded very well to the exercises and got to the point where she swallowed almost every time her mouth was stimulated. This was the milestone we had all been waiting for: It was time to try real food! Yesterday’s menu consisted of 10ml of unsweetened applesauce dipped in lemonade. Not a typical Christmas Day Dinner by any stretch of the mind but hopefully the start of something big. Caroline will practice with this menu for the next eight weeks. After that, she will be evaluated again with a swallow study. This consists of adding barium to the mix so that we can use an x-ray machine to watch as she swallows. Why are we doing this? It’s simple. We want Caroline to have a richer, fuller life. Today it’s applesauce. Yesterday it was learning not to aspirate. The goals are small, manageable. But each little step brings Caroline more fully into the sensory world, a world with the bitter, the sweet and maybe one day even something spicy.